On a hillside setting on a very private acre overlooking Kenmare Bay with Macgillycuddy's Reeks on the horizon. Spectacular mountain and sea views from this lovely two bedroom chalet-style cottage only 1.5 miles from award winning restaurants and pubs in Kenmare Town. The house is comfortably furnished providing a just like home feeling. The deck just off the Kitchen allows you to dine outside on those days that are to nice to be inside. The ground floor features a large living room with open fire, writing desk, table for cards or dinner, TV and convertible sofa. The center hallway leads to full bath with shower. The newly renovated modern kitchen is fully supplied with all items needed to make and enjoy full meals and internet access for computers and WIFI. The kitchen table is located by a picture window with a full view of the Bay and Mountains beyond. Antique Irish Pine furniture and a sliding glass door to patio and deck with furnishings and side yard. Kitchen appliances include gas stove with broiler and oven, dishwasher, fridge/freezer, washer and tumble dryer. The electric coffee maker and kettle so that your coffee and tea service is quick and easy. Stairs to second floor lead to two bedrooms, one with double bed and one with twin beds which can form a king size bed. Each bedroom has sliding glass doors to balconies and a small table with chairs to enjoy a cocktail or cup of tea. Between the bedrooms there is a full bath with tub and linen closet with extra linens as needed. There is a fold-up cot in the main bedroom closet which is available if needed. Utilities include electricity and full gas central heating as well as intenet access and WIFI. I am a New Yorker whose Mother grew up on this land which was part of a large farm, grazing cattle and fields of sheep on the mountain. I came over in 1958 for my first visit when the family home was still in pre-modern fashion. No electricity, no running water, just joy and fresh food cooking in the fireplace, with water from the well for the cooking and from the stream for the washing up. I fell in love with it all and was able to build this modern cottage on an acre of land given to me, where the view of the Bay and Mountains is quite special. 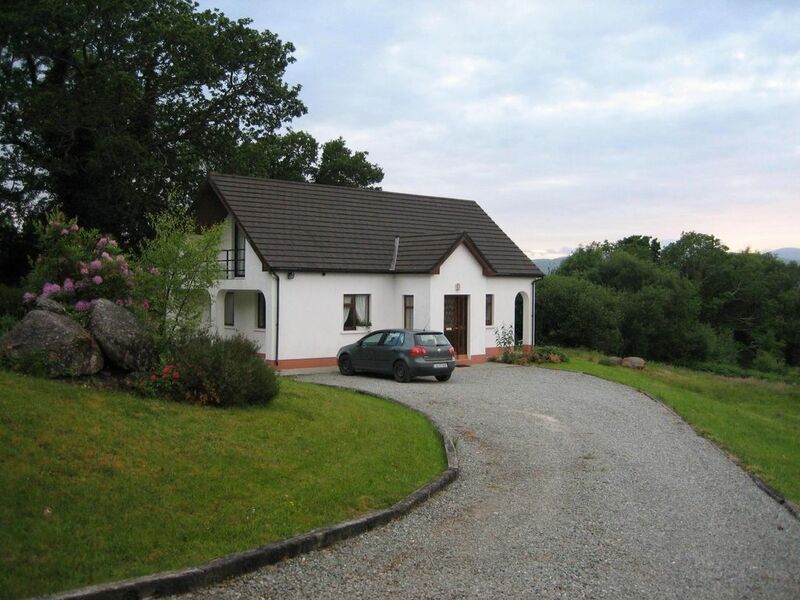 The house is on an acre of land in a rural area about 1.5 miles outside Kenmare town. It is surrounded by open land and neighbors with acres of land and some cattle or sheep to view. One of the beaches can be approached on the Kenmare side of the bridge. A second beach is on Rte 571 about 1 mile past your left turn onto the New Lane on your way to our cottage. Across the Bay is your mountain view of Macgillycuddy's Reeks, the Highest Peaks in Ireland. The house is located about 1 mile from Kenmare Bay. Your view is from the hillside on the south side of the Bay. It includes the Bay and MacGillicuddy's Reeks, the highest peaks in Ireland. I could have spent the whole week just sitting on the deck looking out over the back garden (and bird feeder) to the gorgeous view out over the Bay of Kenmare. But there was so much to see and do ... the Ring of Beara & Ring of Kerry, the boat trip to the Skelligs, Healy Pass and Ballygheama Gap, the walking trails at Glenchaquin and Glengarriff, the birding in West Cork, the town of Kenmare ... We had a brilliant stay and would do it all over again except for longer! Thank you for your thoughts about your Holiday at Tuatha Murtagh. I know exactly what you mean as I enjoy my stay there every time we go. I am blessed to have such a treasure in my life and It is an extra joy when someone sends in a comment. Be well and take care. We had a great 5 days at this comfortable, well equipped cottage. It has many nice touches such as North American friendly plug adapters and basic spices for cooking. We felt right at home. We recommend contacting Helen directly for instructions re location and gaining entry since the HomeAway site was no help! Nice quiet cottage in good local with a great view. Not fancy but nice. A cozy, little Irish cottage...2 bdrms...2 baths tucked away from the center of town but an easy access drive. Close to both the Ring of Beara & the Wild Atlantic Way as well as the Ring of Kerry - Glengariff - Castletownbere - Gleninchiquin Park & others. Spectacular view! Perfect. I am the owner and yes, I love going there. Beautiful weather in a beautiful place. We toured the Dingle, the Ring of Kerry and the Beara. I found the Bear the most beautiful and most interesting. Perfectly located 5 minutes from Kenmare with easy reach to Sheep's Head, Beara and Dingle Peninsulas. Wonderful view from the kitchen window and the master bedroom over the bay. Two deer visited the yard one morning. Beds are comfortable and the place is beautifully equipped. It was an excellent place to stay for a week. Family favorites - Our daily walk along the "New Lane" , about 1/2 hour to start the day, wave to neighbors and few cars. Up close and personal with the cows, goats and horses along the way. The views of the Bay and the mountains on both sides gives you an incentives to explore. The Seal-watching Cruise from the pier and the live theater at Carnegie Arts Center in town are must do's. Gleninchaquin Park on R571 west about 7 miles is best for breathtaking landscapes and scenery on a charming hike up the river walk as the river rushes by your path. Kenmare Stone Circle, the largest in SW Ireland, Molls Gap and the lakes beyond on the mountain road to Killarney are all worth a visit. You need at least 7 days visit to savor all the special places.